Two-time FA Cup winner Phil Parkes says fans and the club need to come together in the face of the adversity currently besetting West Ham. Inconsistent performances, poor results and a barrage of criticism for former manager Slaven Bilic and the club’s owners have made for an uncomfortable season so far. But writing in his exclusive column for Blowing Bubbles, the legendary Irons keeper said it was vital that West Ham remained United. “A couple of decent results can change everything and it remains early in the season,” he wrote. “However the performances have been poor by and large and something needs to change pretty quickly. 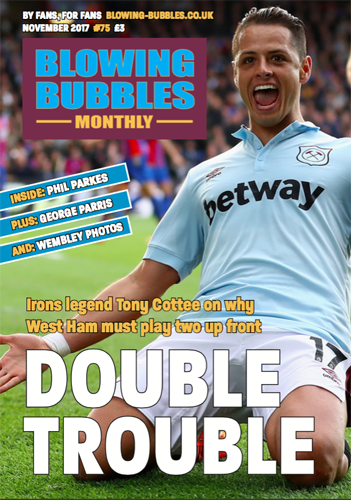 For more thoughts and views from Phil Parkes, pick up a copy of the latest edition of Blowing Bubbles – out now.